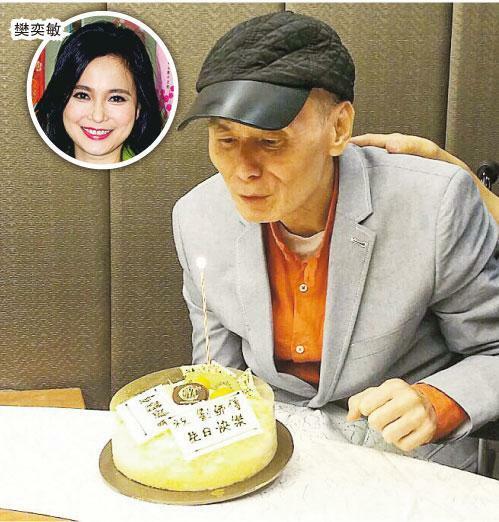 Gordon Lau Ka Fai earlier celebrates his 64th birthday on August 22nd with a group of friends. They picked him up at the nursing center to celebrate with dinner; his friends not only prepared a cake but also his favorite roast goose leg for him. Fan Yik Man was not in Hong Kong that day. She said that yesterday she just returned to Hong Kong and immediately went to work. She was also busy with Brother Ka Fai's affairs. Lau Ka Fai had a stroke in 2011, making both movement and speech difficult for ihm. 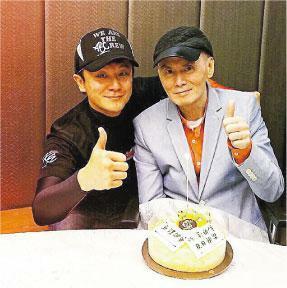 Fan Yik Man said that his condition has improved a lot, as were his spirit and mood. His doctor of 4 years also said that Brother Ka Fai spoke clearer than before. The nurses at the nursing home revealed that he constantly tried to flirt with girls. Fan Yik Man often arranged outdoor activities for him. Every time he went out he personally picked out his clothes. He was the happiest when he saw his friends. She also said that Brother Ka Fai watched FOUR AMIGOS BON VOYAGE, after which he would want to go on vacation. She joked that for now she has only planned for him to visit Launtau Island. He would need strong men to go with him, when someone gave him a hand he could walk very far with a cane.